Organize the Utility Room, Garage, Office, Basement, Shop, or Attic! Products are in stock, but not sold online. 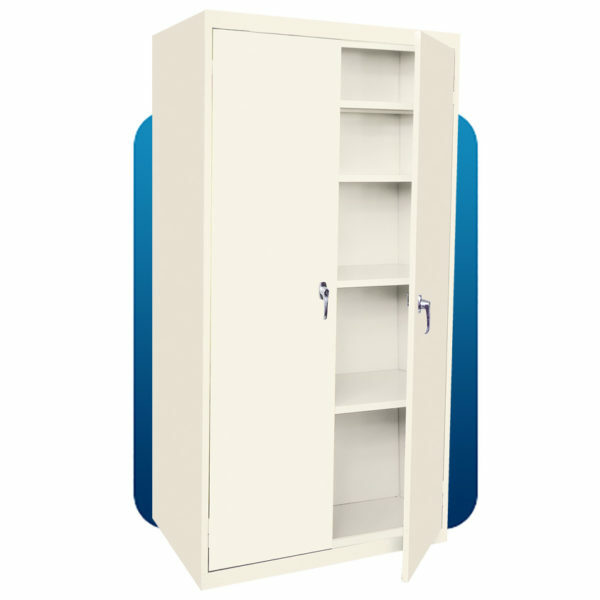 The FS-357 Home Storage Center is a strong, multipurpose steel cabinet with dimensions that will fit into any area where secure, economical storage is needed. Cabinets are designed and produced to provide long-term residential and business storage. Assembled at the factory with electric welding for maximum strength. All 4 shelves are welded in place for extra support, carrying capacity, and to reinforce the cabinet. No assembly required. Cabinets are shipped set-up and ready to use. Cabinets are supplied with two (2) die cast locking handles for security and convenience. Cabinets are finished with powder coat paint in attractive, neutral colors that will blend with any decor.